Past experience taught Rajeev Jain, 45, invaluable lessons. The MD and CEO of Bajaj Finance, a management graduate from Manipal, credits his current success to two previous assignments - a management accounting job at Eicher Span Financial, his first assignment, in the early 90s and then a product management stint in 1999 with ANZ Grindlays. "I did both the jobs for a year, but they had a big impact on me in understanding accounting as well as product dynamics," he says. Jain has been at the helm of affairs at Bajaj Finance for eight years. In this period, he has transformed the small-sized company into one of the fastest growing NBFCs in India. The numbers alone tell a story. The revenues have soared from Rs 400 crore when he joined to Rs 5,400 crore. The profits have pole-vaulted from Rs 47 crore to close to Rs 900 crore. The assets under management have swelled from Rs 2,761 crore to a staggering Rs 32,410 crore. There is more. The assets or balance sheet size at Rs 37,964 crore gives many of the old private sector banks, such as Ratnakar Bank, Lakshmi Vilas Bank and Catholic Syrian Bank, a run for their money. It's a remarkable performance at a difficult time for the economy. "I like to build businesses from scratch. I like the start up atmosphere and the enthusiasm associated with it to create a growth story," says a beaming Jain. Many of his friends too believe that the start-up bug is in his genes. Jain was amongst the first ten employees to join GE Money, the financial services arm of global giant GE, in the mid 90s. He was also the first employee of AIG in India - he joined them as Deputy CEO in 2006. "Rajeev is sincere and hardworking with a sharp focus. His decision to join Bajaj was a well-thought-out and logical move," says Manmohan Singh, Head ( Debt Capital Markets ) India & SE Asia at RBS. Jain joined Bajaj Finance after a year-long stint at AIG. But things at the American multinational insurance corporation didn't work out as promised to him. Luckily, the demerger at Bajaj had just happened with Rahul Bajaj carving out the group's businesses among his two sons - older son Rajiv got the auto business, while younger son Sanjiv was handed over the financial services division. The new holding company Bajaj Holdings and Investment Ltd has 31.49 per cent in auto major Bajaj Auto Ltd and 39.16 percent in financial services arm Bajaj Finserv Ltd, which in turn has 74 per cent each in two insurance ventures and 57.53 per cent in Jain managed Bajaj Finance Ltd.
Sanjiv himself was a finance whiz kid and brought in Jain into his fold. The promoters also brought in Nanoo Pamnani, earlier a Citigroup banker and now the Vice-Chairman of Bajaj Finance. Nanoo joined five months before Jain. "Jain fitted in well as he came with MNC background. Today, I can say his work and business ethics are outstanding," says Pamnani. Jain was in a large well-respected domestic group, but there were challenges. 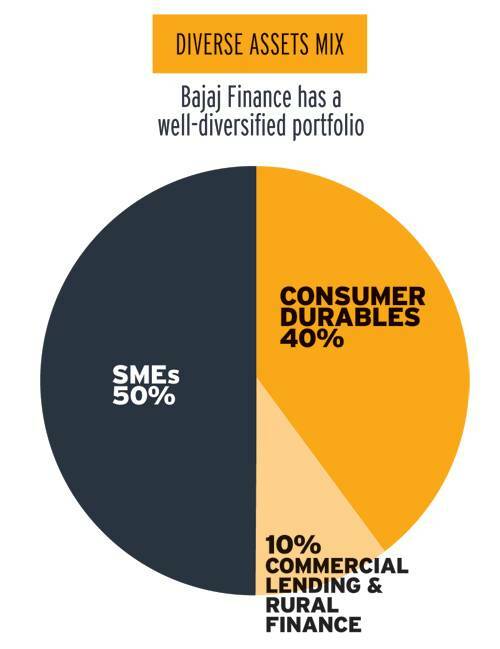 First, the Bajaj brand resonated more with auto than financial services. There was no management bandwidth and product basket. The only saving grace was access to capital, quicker decision making and also the freedom to run a business without any interference. "What pulled me is the group track record of honesty, integrity and strong corporate governance," stresses Jain. Pamnani and Jain started rebuilding the business. "The mandate was to build a sustainable business for the long term," says Jain, who shares a good chemistry with Sanjiv Bajaj. The business that Jain inherited was nothing but a captive kind of finance company with 85 per cent of the revenues coming from auto financing - the balance 15 per cent was consumer durables and personal computers. The asset quality was very poor at 10 per cent gross NPAs. People in the know say Jain replaced the entire management team within six months of joining the company. Jain recruited professionals from top-notch companies - these include Devang Mody, President (Consumer Business), earlier with AIG and GE Money; Rakesh Bhatt, COO, earlier with AIG; Diwakar Pundir, Senior VP (commercial business), a former Citibanker; and Bharat Vasudevan Chief Risk Officer, a former Stan Chart professional. The company was also sitting on a very high capital adequacy of 47 per cent, as against the minimum requirement of 15 per cent. Clearly, there was enough capital to grow the business. "The first two to three years were spent on cleaning the book of bad assets and building the business afresh," says Jain. He maintained a punishing schedule at the company's headquarters in Pune, starting his day at seven in the morning and working till eight in the evening. Jain started right-sizing the branches. He brought down the number of branch locations from 400 to 72, and then scaled up again to 465, building brick and mortar offices in cities with the maximum business potential. He built the entire technology platform, ensured a talent pipeline and changed the financial reporting system. Notwithstanding the slowdown in the global economy and its impact on many of the financial services companies, Jain launched multiple products. From three products (auto, consumer durable and personal computers financing), Jain has now expanded the basket to 34 products including personal loans, business loans, loan against property and co-branded cards, among others. Jain's product development job at ANZ Grindlays came handy. "It makes you cerebral. It allows you to sit down and have a holistic view of how businesses are run," he says. Jain believes that retail finance businesses are all about mid office and back office operations. "The GE Money experience taught me," says Jain, explaining how GE used to be the largest non-captive card issuer in America only processing and running the back office. "If you lend but cannot process, manage or collect, there is bound to be an accident," explains Jain. Currently, the company's advances have been growing at over 30 per cent CAGR, post the global financial meltdown in 2008/09. The company has a diverse asset mix - 40 per cent consumer durables and 50 per cent SMEs. The balance is commercial lending and rural finance. Jain, who is continuously investing in technology, data analytics, talent and HR believes in sustainable growth. Jain, having worked in multiple cities, says mobility in career teaches you how to respect cultures and trains you to manage a diverse cross-cultural team when you are ready for a leadership role. Looking back, Jain says he was greatly influenced by the GE way of doing business. "If my children grow up to be management professionals, I would want them to work for GE. That is the kind of lasting impression GE made on a whole lot of professionals in India," says Jain. "GE is a benchmark for non-banks when it comes to building a well diversified portfolio, sustainable growth, shareholders return, risk management and people practices," he adds. Not everything has gone in favour of Jain. The company built a Rs 2,000 crore infrastructure book comprising construction equipment loans, energy and mining, which it later scaled down to Rs 350 crore. "We initially saw an opportunity as an entrepreneur and also walked away when we realised it is not our cup of tea," says Jain. Meanwhile, given the scorching pace at which Bajaj Finance is growing, the company will require a banking platform to compete with banks in the retail business, because of constraints on the funding side. The company is expected to end the year with Rs 45-47,000 crore loan book by the end of the year. In the next five years, Bajaj Finance will have Rs 1,25,000 crore balance sheet size. The company, however, failed to get a universal banking licence two years ago. "In the next five to seven years, we don't see any constraint in operating without a bank," says Jain. In fact, Jain is now focused on changing the funding mix which is predominantly bank financing and debt funded. "We are in our next phase of journey as a company. Our asset side diversification is largely complete. We will now work towards diversifying retail liabilities or deposits," says Jain. The current contribution of retail fixed deposits is in single digit. "In the next five years, we will have 20-22 per cent of the balance sheet funded by retail deposits," says Jain. Many say the competition to Bajaj Finance will also come from new Payments banks and Small Finance banks in the digital space as well as the rural market. financing. In addition, the loan against property and home loan portfolio could also get impacted if there is a fall in property prices. "The unsecured loans have also increased recently. This portfolio could also pose a risk," says the report. "The challenge in this sector is to have a profitable growth with suitable risk management in place. The evidence of that is very low NPAs with strong business growth that is rewarded by the market as reflected in share price," says Manmohan Singh, who knows him for close to two decades. Jain is focusing on customer experience, and product and process innovations to create a differentiated and profitable business model. Jain has launched India's first EMI finance app which gives loan approvals in 60 seconds. The company has already given some 82,000 approvals in less than three weeks. "We think it is informational and will change the way our business model will work in the years to come," says Jain. Many banks are now studying his EMI app model. Clearly, the start-up CEO is taking a lead in the digital world.